Contains Resveratrol which is concentrated in the skin of the grapes Said to reduce the risk of heart disease-hence the cuurent theory of how small amounts of red wine may have health benefits. It has peviously been shown to have potential properties to work as an antioxident, antocoagulant,anti-inflammatory. The cultivation of grapes began 6000-8000-years ago , residues have been found in jars unearthed from this period. 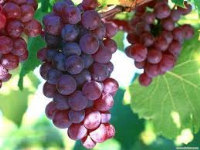 In the bible grapes are first mentioned when Noah grew them on his farm.The Greek God Dionysus was god of the grapes and is portaryed with grape leaves on his head. 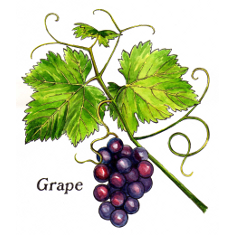 In Christian art, grapes often represent the blood of Christ.